Ki is a small village a few kilometers away from Kaza. The spectacular Ki Monastery sits perched above it and is the area's most recognized sight. 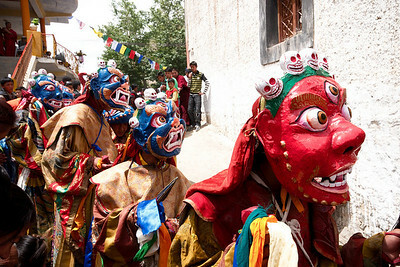 We had heard that every July the monastery holds a Chaam Festival, a Buddhist ritual involving music and dance performed by monks. We had arrived in the Spiti valley in the last week of July and despite asking a handful of locals, were unable to confirm whether or not the festival was taking place. The staff of both hotels had no idea what I was talking about when I mentioned Chaam. As James was sick, we were taking it easy in Kaza, sleeping in and not planning too many activities. We had found a small restaurant where we ate noodles every morning. The restaurant was in Kaza's central square, this is where most tourists ended up for meals or to access the internet at the town's only internet cafe. One morning we arrived for our morning noodles to find the plaza and its restaurants emptier than usual. Sitting at an outdoor table we were greeted by a local travel agent who inquired "why aren't you guys at the Chaam dance?". Somehow every tourist in town knew of the festival but us. Despite having inquired the night before at our hotel. We sped through our already late breakfast, got help from the travel agent finding a driver and were off towards Ki by noon. James was in rough shape, it was probably the worst day of his allergic reaction, but he dragged himself out nonetheless. We arrived at the festival at the end of lunch. A communal meal was just wrapping up and locals were settling into the monastery courtyard for more dancing. Antonia and I squeezed in with women and children on the ground level and James and Yann watched from the balcony above. The crowd jostled for the best position from which to view the monks as they paraded onto the courtyard in their bright robes. Four young novice monks were in charge of crowd control. 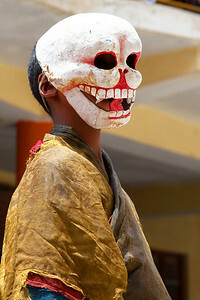 Dressed in tattered robes and scary masks and armed with sticks, they patrolled vigilantly, even whacking people if they attempted to encroach on the monks' dance floor. The monks danced for almost two hours, spinning and stomping while musicians kept a trance inducing beat on large drums and Tibetan long horns. The older monks wore the larger, elaborate masks but moved little, restricted by their age and the weight of their costumes. The younger monks spun around them, almost never pausing. As the dancers spun, their colourful robes would rise revealing their beautiful but cumbersome boots highlighting the difficulty of their movements. We watched intently, absorbed in the music and the coordinated movements of the dancers. The ritual ended with final prayers from the microphone wielding senior monks and the lighting of a gasoline soaked pyre, startling the crowd (and visibly the monks who lit the fire). What the crowd was really waiting for however, was the final procession of dancers and monks leaving the courtyard. Pilgrims of all ages rushed to throw themselves on the ground before the procession reached them. They lined the entire walkway leading away from the monastery down to the village. The monks, still in full costume, stepped over the pilgrims, one at a time. It was a chaotic and magnificent scene. Before leaving Kaza we returned to Ki to visit the monastery and get one more look at its spectacular setting. Our visit to Ki will remain a highlight of our lives.